Main Languages spoken are Bangla - 88% (by Bengali Muslim community), Urdu - 1% (by the Bihari Muslim community), Assamese - 1% (by the Assamese Muslim community). Bangladesh is a Muslim majority nation and Islam is the official religion of the People's Republic of Bangladesh. The Muslim population is approximately 190-200 million,constituting 90% of the total population as of 2011 and making Bangladesh the fourth-largest Muslim majority nation in the world (after Indonesia, Pakistan) and India). Religion has always been a strong part of Bangladeshi identity, but the specific identity has varied at different times. Bangladesh although a developing country is one of the few secular Muslim majority countries in the world. Islam was introduced to Bengal in at least 7th-8th century and later became main religion coming from mainly by the arrivals of Arab and Persian missionaries and merchants. Syed Shah Nasir Al-Deen (or Shah Nasir Uddin) was originally from Iraq but came to Bangladesh to spread Islam. Early Arab Muslims however established commercial as well as religious contacts within the region before the conquest, mainly through the coastal regions as traders and primarily via the ports of Chittagong. Arab navigation in the region was the result of the Muslim reign over the Indus delta. The activities of the Muslims were expanded along the entire coast of South Asia including the coasts of Bengal. The religion of Islam entered the region in many different ways, the Muslim traders, the Turkic conquest and, the missionary activities of the Muslim Sufis. One of the authentications of the Arab traders present in the region was the writings of Arab geographers, found on the Meghna River located near Sandwip on the Bay of Bengal. This evidence suggests that the Arab traders had arrived along the Bengal coast long before the Turkic conquest. The Arab writers also knew about the kingdoms of Samrup and Ruhmi, the latter being identified with the empire of Dharmapal of the Pala Empire. The earliest mosque in South Asia is possibly in Lalmonirhat, built during or just after the Prophet Muhammad's lifetime. Between the 8th century and 12th century, the Buddhist dynasty known as the Pala Empire ruled Bengal. During that time, the majority of the population in Bengal were thought to be Buddhists. After the decline of the Pala dynasty, the Sena dynasty came to power. The large scale conversion to Islam began in the 13th century and continued for hundreds of years. Conversion was generally collective rather than individual. The mass conversion resulted in a syncretic religion where Hindu deities begin to be venerated as Muslim pirs. One of the notable Muslim pirs was Shah Jalal. He arrived in the region of Sylhet in 1303 with many other disciples to preach the religion to the people. However, according to a 16th-century biography by Shaikh ‘Ali (d. 1562), a descendant of one of Shah Jalal's companions, Shah Jalal had been born in Turkestan, where he became a spiritual disciple of Saiyid Ahmad Yasawi, one of the founders of the Central Asian Sufi tradition. According to legend, Shah Jalal, came to Sylhet from Delhi with a band of 360 disciples to preach Islam and defeated the Raja Gour Gobinda in a dispute. As a result, Sylhet developed into a region that was home to numerous saints and Islamic shrines[better source needed] According to sources, his uncle, Sheikh Kabir, one day gave Shah Jalal a handful of earth and asked him to travel to Hindustan with the instruction that he should settle down at whichever place in Hindustan whose soil matched completely in smell and color, and devote his life for the propagation and establishment of Islam there. Shah Jalal journeyed eastward and reached India in 1300, where he met with many great scholars and mystics. He arrived at Ajmer, where he met the great Sufi mystic and scholar, Khawaja Gharibnawaz Muinuddin Hasan Chisty, who is credited with much of the spread of Islam in India. In Delhi, he purportedly met with Nizamuddin Auliya, another major Sufi mystic and scholar. During the later stages of his life, Shah Jalal devoted himself to propagating Islam to the masses. Under his guidance, many thousands of Hindus and Buddhists converted to Islam. Shah Jalal become so renowned that even the famed Ibn Battuta, whilst in Chittagong, was asked to change his plans and go to Sylhet to visit him. On his way to Sylhet, Ibn Battuta was greeted by several of Shah Jalal's disciples who had come to assist him on his journey many days before he had arrived. [dubious – discuss] On meeting Shah Jalal, Ibn Battuta described him as tall and lean, fair in complexion and lived by the mosque in a cave, where his only item of value was a goat from which he extracted milk, butter, and yogurt. He observed that the companions of Shah Jalal were foreigners and known for their strength and bravery. Ibn Battuta also mentioned that many people would visit him and seek guidance. Shah Jalal was therefore instrumental in the spread of Islam throughout north east India including Assam. During the Sultanate period, a syncrestic belief system arose due to mass conversions. As a result, the Islamic concept of tawhid was diluted into the veneration of saints or pirs. Hindu deities became popular pirs: goddesses such as Shitala (goddess of smallpox), Oladevi (goddess of cholera) and Durga were worshipped as pirs as Olabibi and Bonbibi. The British East India Company was given the right to collect revenue from Bengal-Bihar by the treaty of Allahabad after defeating the combined armies of Nawab Mir Qasim of Bengal, Nawab of Awadh and Mughal emperor at the Battle of Buxar. They annexed Bengal in 1793 after abolishing local rule (Nizamat). The British looted the Bengal treasury, appropriating wealth valued at US$40 billion in modern-day prices. Due to high colonial taxation, Bengali commerce shrank by 50% within 40 years; while British imports flooded the market. Spinners and weavers starved during famines. Bengal's once industrious cities became impoverished. The East India Company forced opium and indigo cultivation. The permanent settlement dismantled centuries of joint Muslim-Hindu political, military and feudal cooperation. The Bengal Presidency was established in 1765. Rural eastern Bengal witnessed the earliest rebellions against British rule, including the Faraizi movement led by Haji Shariatullah and the activities of Titumir. The mutiny of 1857 engulfed much of northern India and Bengal, including in Dhaka and Chittagong. Following the mutiny, the United Kingdom gained direct authority and established the British Raj. The influence of Christian missionaries increased in this period. To counter this trend, Reazuddin Ahmad Mashadi, Muhammad Reazuddin Ahmad of the Sudhakar newspaper and Munshi Mohammad Meherullah played a prominent role. The colonial capital Calcutta, where Bengali Muslims formed the second largest community, became the second largest city in the British Empire after London. The late 19th and early 20th-century Indian Renaissance brought dramatic social and political change. The imparting of Western law, government and education ushered modern enlightenment, creating a new politically conscious middle class and a new generation of leaders in politics, arts and science. Sir Syed Ahmed Khan pioneered English education among British Indian Muslims, with many Bengali Muslims enrolling in Aligarh Muslim University. The First Partition of Bengal incubated the broader anti-colonial struggle. In 1906, the All India Muslim League was formed during the Muhammadan Education Conference in Dhaka. A Muslim middle class emerged during the same period. The University of Dhaka played a key role in emancipating Bengali Muslim society, with progressive groups like the Freedom of Intellect Movement and the Muslim Literary Society. Bengali Muslims were at the forefront of the Indian Independence Movement, including the Pakistan Movement for the rights of minorities. Islamic sentiments powered the definition of nationhood in the 1940s when Bengalis united with Muslims in other parts of the subcontinent to form Pakistan. Defining themselves first as Muslims they envisaged a society based on Islamic principles. However, by the beginning of the 1970s the Bengalis were more swayed by regional feelings, in which they defined themselves foremost as Bengalis before being Muslims. The society they then envisioned was based on western principles such as secularism and democracy. While Islam was still a part of faith and culture, it no longer informed national identity. The phenomenon both before and after the independence of Bangladesh was that the concept of an Islamic state received more support from West Pakistanis than from East Pakistanis. Bangladesh was established secular. The Bangladeshi constitution enshrined secular and democratic principles. Kakrail Mosque, Dhaka. The Tablighi Jamaat movement in Bangladesh is mostly based here. As with the rest of the Indian subcontinent, the majority of Muslims in Bangladesh are traditional Sunni, who mainly follow the Hanafi school of jurisprudence (madh'hab) and consequently the Maturidi school of theology. The majority of them are Deobandi although the Berelvi has a substantial following; the Deobandi, in the form of Qawmi institutions, own the vast majority of private Islamic seminaries and produce the majority of the ulema in Bangladesh. Among Sunnis who are not traditional Hanafi, the Salafi-influenced Ahle Hadith and the Jamaat e Islami have a substantial following. There are also few Shi'a Muslims, particularly belonging to the Bihari community. The Shi'a observance commemorating the martyrdom of Ali's sons, Hasan and Husayn, are still widely observed by the nation's Sunnis, even though there are small numbers of Shi'as. Among the Shias, the Dawoodi Bohra community is concetrated in Chittagong. The Ahmadiyya Muslim Community, which is claimed to be non-Muslim by mainstream Muslim leaders, is estimated to be around 10,000, the community has faced discrimination because of their belief and have been persecuted in some areas. Muslims who reject the authority of hadith, known as Quranists, are present in Bangladeshi academia. According to an estimate approximately 26% of Bangladeshi Muslims identify themselves with a Sufi order, almost half of whom adhere to the Chishti order. During the Sultanate period, syncrestic Sufis emerged and formed khanqahs and dargahs that serves as the nerve center of local communities The tradition of Islamic mysticism known as Sufism appeared very early in Islam and became essentially a popular movement emphasizing worship out of a love of Allah. Sufism stresses a direct, unstructured, personal devotion to God in place of the ritualistic, outward observance of the faith and "a Sufi aims to attain spiritual union with God through love" An important belief in the Sufi tradition is that the average believer may use spiritual guides in his pursuit of the truth. Throughout the centuries many gifted scholars and numerous poets have been inspired by Sufi ideas. According to FirstPost, Sufis have suffered from religious sectarianism, with fourteen Sufis murdered by Islamist extremists from December 2014 to June 2016. The influence of "revivalism" of conservative Sunni Islam has been noted by some. On 5 May 2013 a half a million demonstrators demanding the institution of conservative religious program (organized by the Hefazat-e-Islam movement) -- including a ban on mixing of men and women in public places, the removal of sculptures and demands for the retention "absolute trust and faith in Almighty Allah" in the preamble of the constitution of Bangladesh—paralyzed the city of Dhaka. In 2017 author K. Anis Ahmed complained that attacks on and killings of liberal bloggers, academics and religious minorities, had been brought about by "a significant shift ... in the past few decades" up to 2017 in attitudes towards religion in Bangladesh. During my school years in the 1980s, religion was a matter of personal choice. No one batted an eyelid if you chose not to fast during Ramadan. Today, eat in public during the holiday and you may be chided by strangers. Thanks to shows on cable TV, social media and group meetings, Islamists have succeeded to an alarming degree in painting secularism as a threat to Islam. Muslim women, wearing hijab which is a version of modest Islamic clothing, can be seen shopping at a department store in Comilla, Bangladesh. 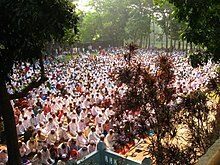 An urban congregation for Eid-ul-Adha prayers in Dhaka. Although Islam played a significant role in the life and culture of the people, religion did not dominate national politics because Islam was not the central component of national identity. When in June 1988 an "Islamic way of life" was proclaimed for Bangladesh by constitutional amendment, very little attention was paid outside the intellectual class to the meaning and impact of such an important national commitment. Most observers believed that the declaration of Islam as the state religion might have a significant impact on national life, however. Aside from arousing the suspicion of the non-Islamic minorities, it could accelerate the proliferation of religious parties at both the national and the local levels, thereby exacerbating tension and conflict between secular and religious politicians. Unrest of this nature was reported on some college campuses soon after the amendment was promulgated. Khan Mohammad Mirdha's Mosque in Dhaka, built in 1706 (18th century old mosque). Bangladesh has a vast amount of historic mosques with its own Islamic architecture. In Bangladesh, where a modified Anglo-Indian civil and criminal legal system operates, there are no official sharia courts. Most Muslim marriages, however, are presided over by the qazi, a traditional Muslim judge whose advice is also sought on matters of personal law, such as inheritance, divorce, and the administration of religious endowments. The inheritance rights of Muslim in Bangladesh are governed by The Muslim Personal Law (Shariat) Application Act (1937) and The Muslim Family Laws Ordinance(1961). Article 2 of The Muslim Personal Law Application Act provides that questions related to succession and inheritance are governed by Muslim Personal Law (Shariat). Article 2 proclaims: "any custom or usage to the contrary, in all questions (save questions relating to agricultural land) regarding intestate succession, special property of females, including personal property inherited or obtained under contract or gift or any other provision of Personal Law, marriage, dissolution of marriage, including talaq, ila, zihar, lian, khula and mubaraat, maintenance, dower, guardianship, gifts, trusts and trust properties, and waqfs (other than charities and charitable institutions and charitable and religious endowments) the rule of decision in cases where the parties are Muslims shall be the Muslim Personal Law (Shariat)." Post-1971 regimes sought to increase the role of the government in the religious life of the people. The Ministry of Religious Affairs provided support, financial assistance, and endowments to religious institutions, including mosques and community prayer grounds (idgahs). The organization of annual pilgrimages to Mecca also came under the auspices of the ministry because of limits on the number of pilgrims admitted by the government of Saudi Arabia and the restrictive foreign exchange regulations of the government of Bangladesh. The ministry also directed the policy and the program of the Islamic Foundation Bangladesh, which was responsible for organizing and supporting research and publications on Islamic subjects. The foundation also maintains the Baitul Mukarram (National Mosque), and organized the training of imams. Some 18,000 imams were scheduled for training once the government completed establishment of a national network of Islamic cultural centers and mosque libraries. Under the patronage of the Islamic Foundation, an encyclopedia of Islam in the Bengali language was being compiled in the late 1980s. Another step toward further government involvement in religious life was taken in 1984 when the semiofficial Zakat Fund Committee was established under the chairmanship of the president of Bangladesh. The committee solicited annual zakat contributions on a voluntary basis. The revenue so generated was to be spent on orphanages, schools, children's hospitals, and other charitable institutions and projects. Commercial banks and other financial institutions were encouraged to contribute to the fund. Through these measures the government sought closer ties with religious establishments within the country and with Islamic countries such as Saudi Arabia and Pakistan. The members of the Ulama include Mawlānā, Imams, Ulama and Muftis. The first two titles are accorded to those who have received special training in Islamic theology and law. A maulvi has pursued higher studies in a madrassa, a school of religious education attached to a mosque. Additional study on the graduate level leads to the title Mawlānā. The madrassas are also ideologically divided in two mainstreams.The Ali'a Madrassa which has its roots in Aligarh Movement of Sir Syed Ahmed Khan Bahadur and the other one is Qawmi Madarassa. The Constitution establishes Islam as the state religion but provides for the right to practice—subject to law, public order, and morality—the religion of one's choice. The Government generally respects this provision in practice. The Government (2001–2006) led by an alliance of four parties Bangladesh Nationalist Party, Jamaat-e-Islami Bangladesh, Islami Oikya Jote and Bangladesh Jatiyo Party banned the Ahmadiya literatures by an executive order. However, the present government, led by Bangladesh Awami League strongly propagates secularism and respect towards other religion. Despite all Bangladeshis saying that religion is an important part of their daily lives, Bangladesh's Awami League won a landslide victory in 2008 on a platform of secularism, reform, and a suppression of radical Islamist groups. According to a Gallup poll conducted in 2009, simultaneous strong support of the secular Awami League and the near unanimous importance of religion in daily life suggests that while religion is vital in Bangladeshis' daily lives, they appear comfortable with its lack of influence in government. ^ Bergman, David (28 Mar 2016). "Bangladesh court upholds Islam as religion of the state". Al Jazeera. ^ "Bangladesh dismisses case to drop Islam as state religion". Reuters. 28 March 2016. ^ Bangladesh - The Future of the Global Muslim Population Pew Forum. ^ "National Volume - 2: Union Statistics" (PDF). Population and Housing Census. Bangladesh Bureau of Statistics. 2011. Archived from the original (PDF) on 2015-12-08. Retrieved 2015-08-15. ^ "Statistics Bangladesh 2006" (PDF). Bangladesh Bureau of Statistics. Archived from the original (PDF) on 2008-12-21. Retrieved 2008-10-01. ^ a b "History and archaeology: Bangladesh's most undervalued assets?". deutschenews24.de. 2012-12-21. ^ a b Mahmood, Kajal Iftikhar Rashid (2012-10-19). সাড়ে তেরো শ বছর আগের মসজিদ [1350 Year-old Mosque]. Prothom Alo (in Bengali). ^ "How Islam and Hadith Entered Bangladesh". ilmfeed. 26 March 2017. Retrieved 19 April 2018. ^ "Ancient mosque unearthed in Bangladesh". Al Jazeera English. 2012-08-18. Retrieved 2016-11-07. ^ a b Banu, U.A.B. Razia Akter (1992). Islam in Bangladesh. New York: BRILL. pp. 34–35. ISBN 90-04-09497-0. Retrieved 31 July 2016. ^ a b c Eaton, Richard M. (1993). The Rise of Islam and the Bengal Frontier, 1204-1760 (PDF). Berkeley: University of California Press. ^ a b Karim, Abdul (2012). "Shah Jalal (R)". In Islam, Sirajul; Jamal, Ahmed A. (eds.). Banglapedia: National Encyclopedia of Bangladesh (Second ed.). Asiatic Society of Bangladesh. ^ Batuta, Ibn (1978). Ghosh, P. N. (ed.). Ibn Batutah's Account of Bengal. Translated by De, Harinath. Calcutta: Prajña. p. 76. OCLC 9088127. ^ "Which India is claiming to have been colonised?". The Daily Star. 2015-07-31. ^ Pandey, Jhimli Mukherjee (10 June 2009). "Rare 1857 reports on Bengal uprisings". The Times of India. ^ Khan, Alamgir (14 July 2014). "Revisiting the Great Rebellion of 1857". The Daily Star. ^ "Ahmad, Muhammad Reazuddin". Banglapedia. Bangladesh Asiatic Society. Retrieved 2016-03-20. ^ Jones, Kenneth W. (1992). Religious Controversy in British India: Dialogues in South Asian Languages. New York: SUNY Press. pp. 94–96. ISBN 0791408280. Retrieved 2016-03-20. ^ Mukhopadhay, Keshob. "An interview with prof. Ahmed sharif". News from Bangladesh. Daily News Monitoring Service. Retrieved 2016-03-20. ^ Willem van Schendel (12 February 2009). A History of Bangladesh. Cambridge University Press. p. 183. ISBN 9780511997419. ^ Baxter, Craig (1997). Bangladesh: From A Nation To A State. Westview Press. p. 70. ISBN 978-0-813-33632-9. ^ Baxter, Craig (1997). Bangladesh: From A Nation To A State. Westview Press. p. 88. ISBN 978-0-813-33632-9. ^ "Chapter 1: Religious Affiliation". The World's Muslims: Unity and Diversity. Pew Research Center's Religion & Public Life Project. 2012-08-09. Retrieved 2013-09-04. ^ Ferdousi, Ishrat. "Yasmin Farzana Shafi". The Daily Star. Retrieved 14 February 2017. ^ "Bangladesh Religious Freedom 2007". US Department of State. Retrieved 2007-01-01. ^ Clinton Bennett; Charles M. Ramsey (1 March 2012). South Asian Sufis: Devotion, Deviation, and Destiny. A&C Black. ISBN 978-1-4411-3589-6. ^ a b Burke, Thomas Patrick (2004). The major religions: An Introduction with Texts. Wiley-Blackwell. p. 280. ISBN 1-4051-1049-X. ^ Shah, Idries (1991) [First published 1968]. The Way of the Sufi. Penguin Arkana. pp. 13–52. ISBN 0-14-019252-2. References to the influence of the Sufis, see Part One: The Study of Sufism in the West, and Notes and Bibliography. ^ Shah, Idries (1999) [First published 1964]. The Sufis. Octagon Press Ltd. pp. all. ISBN 0-86304-074-8. References to the influence of the Sufis scattered throughout the book. ^ "Sufis in Bangladesh now live in fear after several machete killings". Firstpost. 2016-06-02. Retrieved 2017-02-16. ^ "Bangladesh | The World Almanac of Islamism". almanac.afpc.org. Retrieved 2017-02-16. ^ a b c AHMED, K. ANIS (3 February 2017). "Bangladesh's Creeping Islamism". New York Times. Retrieved 4 February 2017. ^ a b "Under fire, NCTB moves to fix textbook errors". The Daily Star. 7 January 2017. Retrieved 14 February 2017. ^ a b "Textbook embarrassments: The strange mistakes on schoolbooks". BangladeshNews 24. 9 January 2016. Retrieved 14 February 2017. ^ Heitzman, James; Worden, Robert, eds. (1989). "Islam in Bangladesh". Bangladesh: A Country Study. Washington, D.C.: Federal Research Division, Library of Congress. p. 78. ^ Heitzman, James; Worden, Robert, eds. (1989). "Islam in Bangladesh". Bangladesh: A Country Study. Washington, D.C.: Federal Research Division, Library of Congress. p. 76. ^ a b c "The Muslim Personal Law (Shariat) Application Act, 1937". Ministry of Law, Justice and Parliamentary Affairs. ^ "Muslim Family Laws Ordinance, 1961". Ministry of Law, Justice and Parliamentary Affairs. ^ "Current Legal Framework: Inheritance in Bangladesh". International Models Project on Women's Rights. ^ a b Heitzman, James; Worden, Robert, eds. (1989). "Islam in Bangladesh". Bangladesh: A Country Study. Washington, D.C.: Federal Research Division, Library of Congress. p. 77. ^ Baxter, Craig (2002). Government and Politics in South Asia. Boulder, CO: Westview Press. p. 294. ISBN 978-0-8133-0185-3. ^ "Article 2A The State Religion". Ministry of Law, Justice and Parliamentary Affairs. ^ "Religion, Secularism Working in Tandem in Bangladesh". Gallup. 2009-07-29. Retrieved 2013-08-16. Eaton, Richard M. (1993). The Rise of Islam and the Bengal Frontier, 1204-1760. Berkeley: University of California Press. ISBN 0-520-20507-3. Karim, Abdul (2012). "Islam, Bengal". In Islam, Sirajul; Jamal, Ahmed A. (eds.). Banglapedia: National Encyclopedia of Bangladesh (Second ed.). Asiatic Society of Bangladesh. This page was last edited on 20 April 2019, at 15:05 (UTC).